Fans of Nintendo's Super Smash Bros. series of fighting games love to tinker, hacking new characters, stages and moves into the game. A soon-to-be-released demo for a Super Smash Bros. Brawl mod named "Project M" takes a different approach. The mod's creators want to tweak Super Smash Bros. Brawl for the Wii and model it after Super Smash Bros. Melee for the GameCube. That doesn't mean that they're looking to create a "Melee clone," however. According to the mod's description, its something of de-make that takes a single generation step back, with a long list of changes designed to make Brawl play more like its GameCube predecessor. Project M is, according to the community team making it, "designed to add rich, technical gameplay to a balanced cast of characters while additionally enhancing the speed of play" and "add in new, universal features to the entire cast to add technical variety to all characters." 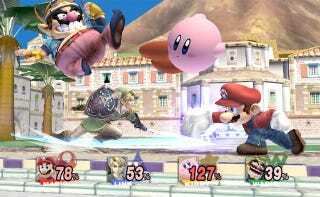 Masahiro Sakurai, the game designer of Super Smash Bros., says he believes Melee was the "sharpest" game of the series. Project M's creators are planning to release a demo version of their creation soon. In the meantime, are there any Super Smash Bros. mods you think are deserving of more attention?